Viktor Yushchenko, the Ukrainian president proclaimed the 2008 a year of remembrance for the innocent victims of the Holodomor. The Holodomor was an artificial famine, created by the hand of Stalin, in efforts to exert Collectivisation, Industrialisation and Russification on Ukraine in 1932-33. On the fertile Ukrainian soil, 7 million Ukrainians died. People travelled from village to village, stretching their arms begging for the crust of a load of bread. Single potatoes were shared between people. People ate bark, leaves, rats, cats and dogs. People who lived through the time, give accounts of the horrors they saw, people eating the bodies of the dead. This was Stalin’s plan for the ruin of our Motherland. If God watched this atrocity, His heart must have suffered from pain and no doubt His eyes were full of tears. 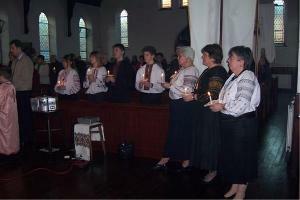 On Sunday 27th January 2008 at 15.30, in the memory of those who suffered and died from starvation, the Ukrainian community in Derby gathered at the church of St. Michael for a remembrance mass, led by Father Mykola Martynyuk. Children and adults wore traditional Ukrainian embroidery, held candles and prayed for those who had starved to death, and honoured the 75th anniversary of the Holodomor in Ukraine. •	The niece of Gareth Jones – Dr. Margaret Siriol Colley. Under the leadership of the head of the Organisation of Ukrainian Women, Mariyka Finiw, an electronic presentation was displayed, under somber music. The presentation included pictures of exhausted and starved children and adults, evidence of Stalin’s orders to commit such atrocities together with photographs of skeletal bodies heaped in rotten graves. The head of the Organisation of Ukrainian Women in Derby, Lida Deremenda with the support of the national secretary, Irka Dobrovolska and members of the UYA, Kateryna Borys, Ivanka Dobrovoska, Stefana Kupranec, Myroslav Lastowestski and Yuliyana Surma explained the history of the holodomor. Luba Sybal and Nadia Surma, recited two poems in Ukrainian, respecting those who had died. Tears seeped onto the candles, while those present listened to the accounts, and look at the photographic achieve. This symbolises the eternal memory of those who died. Eternal memory to them. The Deputy Mayor of Derby, Councillor Barbara Jackson and the chief coordinator of the “Holocaust Memorial Day Committee” – Mr. Phillip O’Brien gave sympathetic speeches. Dr. Margaret Siriol Colley read an account written by her uncle, Gareth Jones who had travelled to Ukraine in 1932-33 a saw with his won eyes the suffering people endured, seeing people slowly dying throughout villages in Ukraine. He was not silent about what he saw, and as a result he was murdered in Mongolia two years after his visit to Ukraine. May our hearts have a place to remember those who became victims of Stalin’s Holodomor. At the end, Joe Kupranec thanks those present for attending. Everyone was invitied for tea and biscuits. Over tea, people shared stories, telling facts about their own lives, what they had lived through, what they’d seen and what they heard from others about the terrible times of the Holodomor. On Monday, 28th January 2008, in the assembly rooms in Derby, the government held an event “Derby’s Response to Holocaust Memorial Day” with the logo, imagine, remember, reflect and react. The main objective of the evening was to show those present that the Holocaust was a tragic episode of 20th century history, a horrific part of European civilisation and international human catastrophe. The Holodomor in Ukraine was included in the event. Horrific crimes, ruin cannot be forgotten and should never be repeated in Europe or in any other part of the globe. The hall was filled with people with different backgrounds, Ukrainians, Poles, Hungarians, Congolese, school children from Littleover Community School and students of the University of Derby. The event was opened by Derby’s deputy Mayor, Councillor Barbara Jackson inviting attendees to remember victims of the Holocaust. Professor Jonathan Powers announced and commentated on the performances of performers from the Congo, Poland, Bosnia and Herzegovina, Ukraine and school children and students of Derby. This was another addition to the history of Ukrainian Diaspora in Great Britain. Ukrainians not only in their communities, but in the wider community acknowledged the Holodomor, particularly for the British population who respected the 7 million people who died during the famine, as a result of Stalin’s commands. This day was a day when we Ukrainians openly appeared with words, “Listen, look, imagine, remember, reflect and react how we were destroyed as a nation, how we were treated and destroyed in any cruel way our suppressors chose, but we suffered, we survived, and we have stood up and defended our right for acknowledgement for existence and for respect for the Ukrainian nation from the whole world. Again a presentation was shown, with a narrative read by members of the UYA and AUW. The day was emotional for those present; it was a commemoration of 75 years since the funerals of our distance and close relatives who were forced to starve to death. Be strong if your alive, don’t allow anyone to put us on our knees, be proud of your Ukrainian heritage and may God help us. At the end of the memorial, to improve the mood and to show the Ukrainian spirit the Ukrainian dance ensemble Hoverla, under the leadership of Joe Kupranec, danced the hopak. Professor Jonathon Powers made a closing speech and thank everyone present for their attendance and invited everyone to enjoy the buffet.